Mesa Single Pedestal Teachers Desk 67"x30"
These Mesa Teachers Desks provide lots of legroom. Wire-management grommets on the work surface prevent clutter, leaving a more open work space. Mesa Teacher Desks from OFM are designed to spend years at the head of the class. 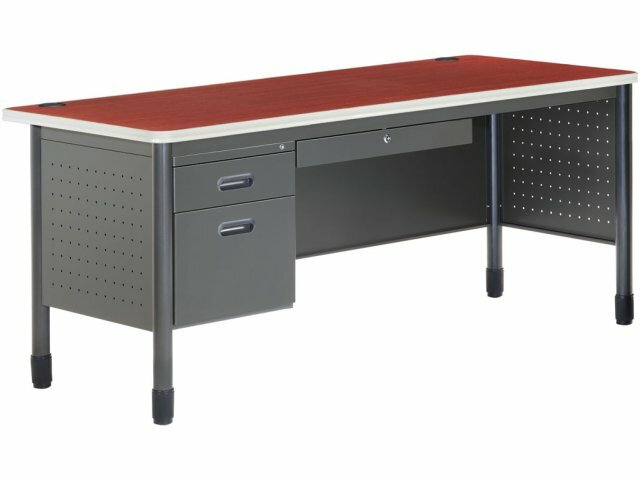 Constructed from heavy-duty, 15-gauge steel, with round steel tubular legs and a durable 1-1/4"-thick, high-pressure laminate top, these teacher's desks will ace the tests of time and use. High-side drawers offer plenty of filing space to organize classroom materials and teaching aids. Locking center drawer and locking pedestals ensure security. Extra protection and shock absorption is granted by the 9mm-thick, T-mold edge banding. Uncluttered: Wire-management grommets keep cables off of desktops. 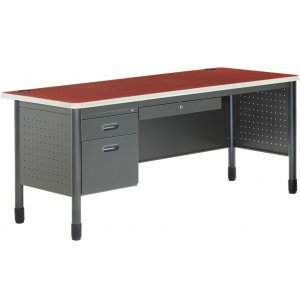 Quality Materials: Built from hefty 15-gauge steel, with a 1-1/4"-thick high-pressure laminate top and 9mm edge banding, these teacher desks are engineered well with top materials. Durable: Desktop is supported by hard-wearing, round steel tubular legs with leveling glides. Convenient Storage: Spacious high-side filing drawers and full suspension ball-bearing drawer slides standard. Locking drawers provide secure storage. Long-lasting: Desk resists signs of wear and tear, with scratch resistant powder-coated paint finish on the panels and legs, and a resilient high-pressure laminate top.